Photo credit: Leonardo. Poland acquires four MLSV41-346 Advanced Jet Trainers. ROME - High-tech company Leonardo has announced that the Armament Inspectorate of Polish Ministry of National Defense has chosen to acquire four more M-346 Advanced Jet Trainers. 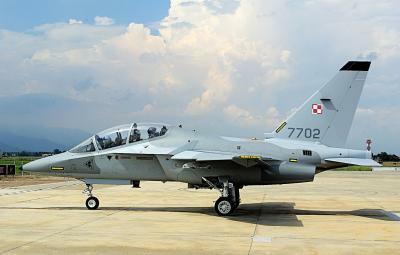 Poland’s fleet will thus extend to 16 aircraft, and become the world’s second largest M-346 export customer. The option, valued at approximately 130 million euro, includes a support package as well as an upgrade of the entire M-346 fleet to the NATO STANAG 4193 Edition 3 IFF standard developed by Leonardo. The Polish Air Force will complete its lead-in-fighter training fleet modernisation with deliveries within 2022. According to Leonardo, 76 total M-346s have been ordered by Italy, Poland, Singapore and Israel to date. Leonardo has stated that they offer the most advanced training solutions as well as a significant cost reduction of up to 50% for an Air Force Cadet to qualify as combat ready on a latest-generation fighter. The company has over 50 years of experience in the training sector. This announcement further strengthens Leonardo’s presence in Poland where it has 3000 highly-skilled employees at its PZL helicopter site in Świdnik. Leonardo has a long-standing collaboration with Polish Armaments Group (PGZ) which includes the Rosomak programme for the Polish Army providing the 30 mm Hitfist Turret in addition to supplying several defence systems like the ground segment for the COSMO-SkyMed earth observation satellites, early warning radar and coastal surveillance systems contributing significantly to Poland’s security.